Get Back In The Saddle Lessons – for adults returning to riding. Join the friendly, supportive and fun-loving group of mature adults who ride with me at Poplar Lane Farm. 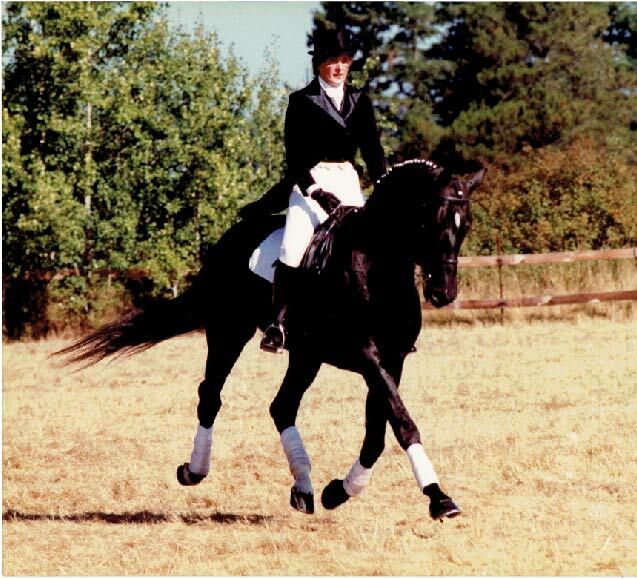 Progress at your own rate on well trained, quiet, show quality horses. The first lesson is an assessment to determine your level of experience on the ground and under saddle. Lessons will then be tailored to meet your needs. You may elect to include round penning as part of your lesson program. If you’ve never worked with a horse in the round pen, you’re in for a great experience. Round penning will give you valuable insight into equine behaviour and psychology and helps develop a trusting, harmonious relationship between you and your horse. By the end of the session, your horse will follow you anywhere in the round pen without the use of a halter or lead rope. If you’ve been riding regularly, then we’ll move forward from your current level of fitness and knowledge in the discipline of your choice. For those “Getting Back in the Saddle”, we’ll take your level of fitness into consideration. New students have the option of taking a one month trial before committing to a regular lesson program. For more information, or to book your one month trial, contact Kathy at kathy@harrisonhorsemanship.com.